Every day, after I have my lunch, I switch on TV and browse through few channels just to find out what's up. Yesterday, as I was going through the channels, I found an interesting phone-in programme, where TV audiences were asking questions to a medical Doctor about obesity and related problems. The Doctor appeared well informed and proficient so I stayed on the channel for next 15 minutes or so. One of the tips given by him to obese people was quite funny. He advised them not to stay in a positions where there bodies are not doing any movement such as slouching and dozing off. Most of us, try to relax, whenever an opportunity comes and go into spells of inactivity. I remember that, when I was in my preteen years, I was a boy of just average or slightly below average height. For next three years, my height grew phenomenally and I became almost a six footer. With this sudden spurt, I developed an awkward kind of posture and I started slouching. My mother and father always used to get angry and kept scolding me, whenever I slouched. They would always say that I would spoil my spine if I sit and stand like that. I do not know, whether spine is affected by slouching, but I know from later experience definitely that sitting erect, helps and reduces your back pain. During my business days, I used to have a manufacturing unit and I would feel uneasy to sit in my office for a long spell and not make a round of the shop floor to find out what's happening. That habit has now so much ingrained in me, that I find it impossible even now to sit with my computer for a longer spell. I must get up after every 15/20 minutes and make a round around the house even today. I always attribute this habit to my lack of ability to concentrate on a subject for a long time. However this Doctor appearing on TV, was actually advising everyone that they should not sit in their chair for long spells but get up and move. For people, who unknowingly allow their bodies to relax or go in spells of inactivity, do not need to have their fathers or mothers around them all the time anymore, to remind them not to slouch or go into spells of inactivity. A new smartphone App called 'Lumoback,' manufactured by an American company Lumo Body Tech Inc. is now available that can substitute for their farthers or mothers and would remind them not to slouch or go into long spells of inactivity. 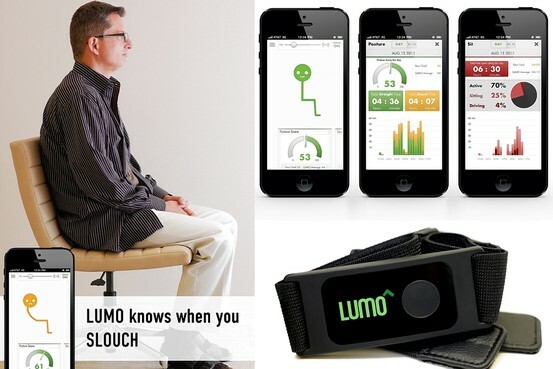 'Lumoback' comes with a sensor that straps around your lower waist to track your posture. Two sizes are available for the strap so it can fit most of the people. These sensors keep tracking your posture and vibrate whenever you slouch. It also tracks steps while walking and running, standing time, sitting time, sleep positions and sleep time. LumoBack's sensor corresponds with a free App running on Apple's iOS devices by means of Bluetooth technology. The sensor can be worn while at computer keyboard, eating a meal, diving a car, sit in a meeting or even while standing and talking to someone. The smartphone App with its armless stick figure that reflects your moves on an iOS device's screen. Gives you warnings. The figure turns yellow and frowns when your posture is poor, and turns green and smiles when your posture is good. This illustration helps you know how to adjust your sitting or standing position. However no one can keep looking at smartphone screen all the time and hence Lumoback also gives you vibrating nags. The first nagging buzz comes after you've been exhibiting bad posture for four seconds, then it buzzes again at 11 seconds. If you don't correct your posture after that, LumoBack assumes you don't want to be corrected again and stops buzzing. Warnings in form of notifications also appear on your iPhone that say things like, "You've been sitting in that chair for 30 minutes. Stand up for yourself!" Another notification could tell you that your posture score is 48 out of 100, and encourage you to try harder to hit your goal of 50 for the day. Once Lumoback is set up by registering user name and his weight and height on the App, it self calibrates, when you move and walk. After that it keeps telling you for how long you sit, stand or sleep. Even while sleeping it would tell you about your sleep positions reflected in the app, which shows how long you sleep each night and how much time on your back, right side, left side and front. Data like this can be helpful if one is advised not to sleep in certain position, like for example avoiding to sleep on a particular side after en eye surgery. Lumoback is likely to be a boon for obese people, as it could make them realize, for how little time they actually remain physically active. Smart Phones / Devices have started substituting 'Smart People' ; now are they going to take over Parenting ? Where does it stop ? !